1990 Chicago White Sox Cap - Fresh Fitted Friday!!!! A few things come to mind when looking upon this photo. The first is that ballplayers had some gee-golly-neat nicknames back in those days. It also seems like Jackson (pictured on right) is wearing two shoes and after looking up his nickname's origin, it turns out there was only one occasion when he went up to bat without wearing shoes. At times, baseball fans can be real jerks and they are jerks with very literal minds and spotless memories to boot. 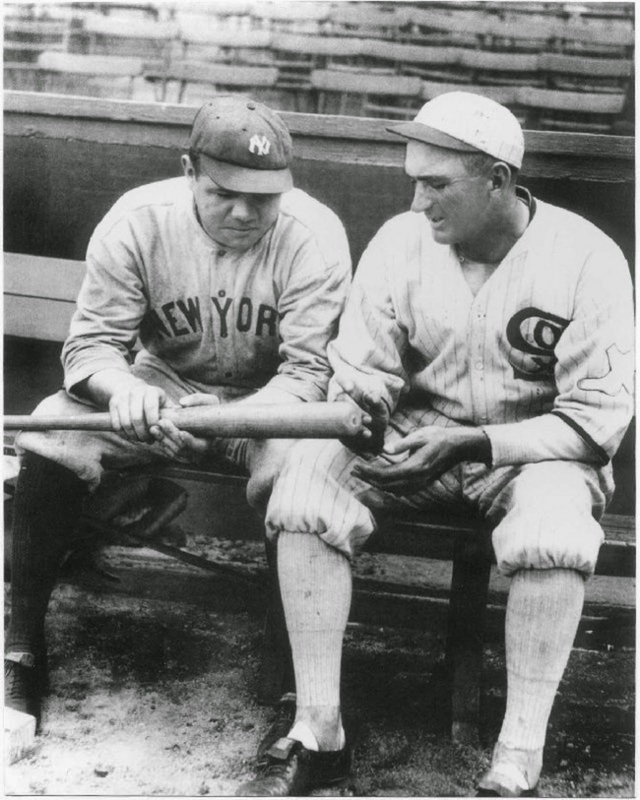 That photo of a New York baseball legend sitting alongside one from Chicago also happens to be the perfect segue for me to talk about my all-time favorite ballplayer, Frank Thomas, who played a majority of his professional career with the Chicago White Sox. 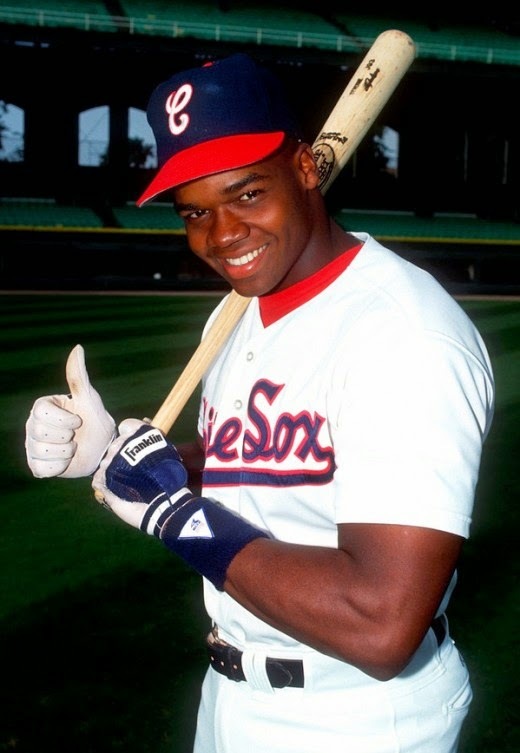 If you never watched him play baseball, then it's hard to believe that this smiley fellow giving a "thumbs up" at the old Comiskey Park was known as "The Big Hurt" because of harm his bat invoked on baseballs thrown by opposing pitchers. I'd say that "The Big Hurt" is a lot more of a gee-golly-neat nickname than than "The Babe" or "Shoeless Joe" but well, that's just like, my opinion, man. My opinion is also that this cap logo is so iconic that the White Sox should seriously consider bringing back this 1987-1990 kit in place of the '83 throwback which has been the regularly-used alternate (nice oxymoron, eh?) uniform over the past few seasons. While I will always look at this cap and think of Frank Thomas, I realize that there is another famous two-sport athlete who will be remembered for wearing it as well and his name is Michael Jordan. 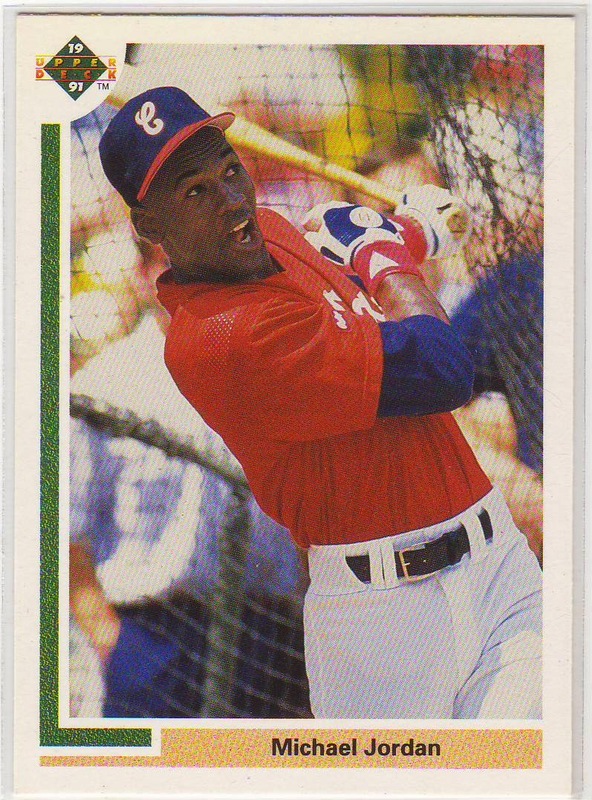 Yeah, you can tell that ball sliced way foul, but MJ just had to act like he drilled it into the left field bleachers. How cool would it have been if he did some tongue-wagging in the shot? I don't have any other major league caps that feature this one's version of the New Era sweatband tag, but in the 1980's Reading Phillies post, I remark on its overall subtleties and how it so closely resembles the tags on this White Sox cap. When comparing this cap's Authentic Diamond Collection tag to the one on the 1992 Seattle Mariners cap that the only real difference I see (besides the fading) is that the tag is fully stitched on the Seattle cap's sweatband, as opposed to the half-hanging action that's happening on this White Sox cap. Because both "Authentic Diamond Collection" tags look so much alike, I feel safe in stating that the tag probably made its debut in 1990, which was the last year the White Sox wore this cap logo. I'm glad to have finally written about some my favorite vintage caps over the past few weeks and I hope you've appreciated the freshness of these gems as well. I realize that I've been on a mostly vintage cap kick lately, so I think you should definitely be looking forward to reading about some newer logo designs in the coming weeks. I'll leave you with a video from 1990 of former Chicago White Sox manager Jeff Torborg discussing the updated look that the team would start wearing the following season. 2014 Hillsboro Hops - Fresh Fitted Friday!!! !